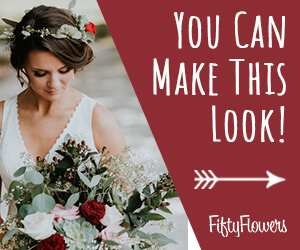 Garland flower swags are designed differently, depending on what flowers you use and where you will hang it. Some flowers wilt more quickly and need a water source such as the Oasis Garland Foam. This is for flowers such as Oriental lilies, callas, hydrangeas, tulips, Gerbera daisies and other water loving varieties. Florists used to create swags by using a mix of long draping greenery (such as the sprengeri fern shown below) and wiring in a mix of flowers on top of the greenery. Keep in mind that this is a bit time consuming and, with no water source, to keep the garland refrigerated if made up in advance. I like to make the swags up in separate sections, as it is easier to design, store and deliver shorter pieces. 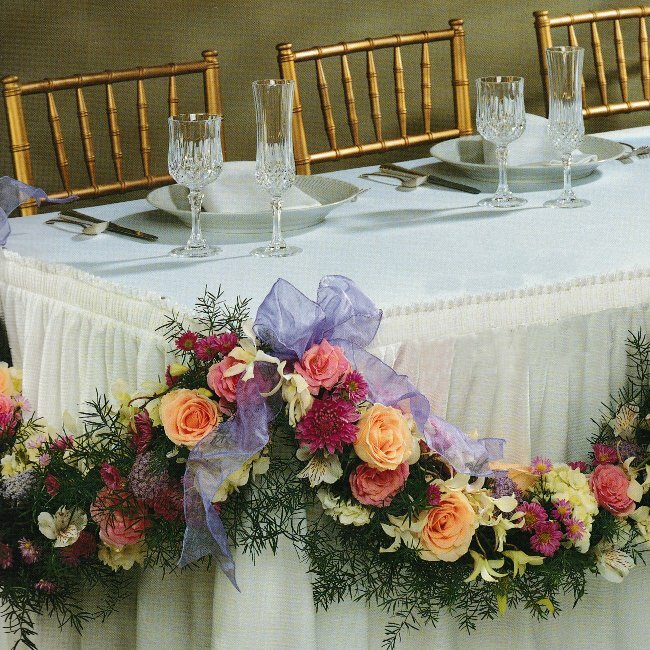 Simply determine how long one drape will be and make each swag of the garland the same length. Upon arrival at the venue, pin the separate garlands onto the front of the table skirt with corsage pins.